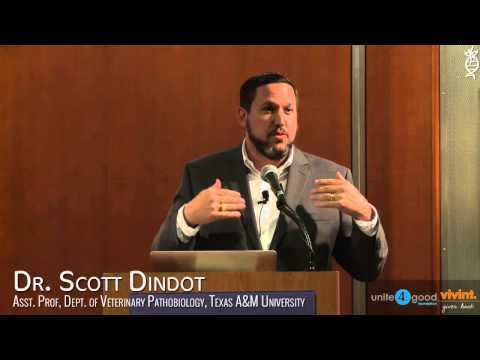 Dr. Scott Dindot is an Associate Professor in the Department of Veterinary Pathobiology at Texas A&M University. He received his Ph.D. in Genetics from Texas A&M, and received postdoctoral training in Dr. Arthur Beaudet’s laboratory at Baylor College of Medicine. Dr. Dindot is a member of the FAST Integrative Research Environment Initiative (FIRE), a consortium of scientists, with precise expertise in Angelman Syndrome (AS), who work collaboratively to identify, characterize and implement new therapeutics for the treatment and ultimate cure of AS. This initiative was launched in 2013, includes five laboratories spanning four universities and is funded in full by donations made to FAST. To date, FAST’s investment in the FIRE Initiative stands at more than $3.4 million. The results of this collaboration have been remarkable and the FIRE team is now working with more than six pharmaceutical and biotechnology companies to prepare for and test potential therapeutics for human clinical trial. His first aim focuses on how expression of paternal UBE3A is silenced, so that more strategies can be developed to activate it. The paternal allele, coding UBE3A, is normal in patients with AS but there is a long, noncoding RNA transcript (ATS-antisense transcript; a.k.a. UBE3A-AS or UBE3A-ATS) sitting on top of it that is essentially turning it “off”, or acting as a STOP. This is called the “imprinting region” and within this region is the UBE3A gene. This ATS is ONLY expressed in neurons of the CNS (central nervous system) and NOT in the rest of the body. Why does the body do this? What is the problem with having the paternal allele on in the CNS and not in the rest of the body? What is the role of the ATS? Is it more complex than simply turning off paternal UBE3A? In mice and humans, inactivation of the paternal allele does not occur in order to reduce UBE3A in the brain as there is more UBE3A found in the brain, from only the maternal allele, than in the rest of the body that has both maternal and paternal genes active. So, the answer for why the paternal allele is silenced is not to keep UBE3A levels lower in the CNS. UBE3A is very tightly regulated, even though one allele is turned off in the CNS, so this process warrants further investigation. What is the importance of the ATS and what will happen if it is shut down in order to turn on UBE3A? Target based approach: To find therapy that will turn on expression of the paternal UBE3A allele in neurons. Through various types of drugs/molecules like topoisomerase inhibitors (e.g. topotecan) and antisense oligonucleotides (ASOs). n be generated using this approach – hundreds of millions compared to millions. Over 17,000 compounds from various libraries have been tested in Dr. Dindot’s lab and to date, he has preliminary “hits” in 35 of the 17,000 compounds tested. It is important to recognize that these are “small molecules” and NOT approved drugs. The goal is to target which small molecules we can move toward pre-clinical trials. These “hits” suggest that they may turn on UBE3A in neurons. These 35 drugs/small molecules/compounds now need further characterization and testing to see how many are real hits versus false positives, and which are worthy of further preclinical evaluation. Symptom (phenotype) based approach: Therapy that targets an individual symptom of AS rather than the missing gene itself. Flies can be assessed with hundreds of compounds over a short period of time compared to mice. This approach is not as rapid as the stem cell approach, but is more efficient to test behavior and phenotype. This approach does not target UBE3A, but rather the symptoms associated with loss of UBE3A. Flies grow quickly in vials and can be used to screen over 100 drugs at a time focusing on larval locomotion, adult locomotion, circadian rhythms, etc. Dr. Dindot’s final aim is to generate higher animal models of AS to help assure treatment will be as safe and effective in human patients as possible. Dr. Dindot, with funding exclusively from FAST, has been working aggressively on developing a pig model of AS and is expecting the first births this summer. This is ground-breaking work and stands to be the first pig model of a neurological disorder ever created, making AS pre-clinical trials of potential therapeutics more appealing to pharmaceutical and biotechnology companies. This animal model will be far more accurate in evaluating how potential treatments will affect the human condition than the mouse model. The pig model will be used as a final stage preclinical tool. It will not replace the mouse or rat models, but rather complement those preclinical studies to determine the efficacy and safety of a potential therapy before it is used in human patients.